This is what may be the first in a series of “Adventures” stories. The basic plot is that some special needs students get to enjoy a series of adventures with a little extra help from accompanying parents and teachers. 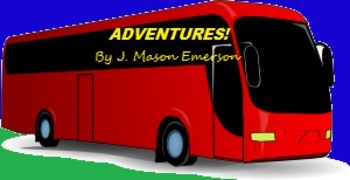 In this first story they board a big red bus and two vans then journey from Olathe, Kansas, up to Nipigon, Ontario, in Canada, enjoying a series of adventures in sightseeing and learning along the way. Of course, in the process readers get to learn a lot in regard to general social studies, geography of the U.S. and Canada, cultural differences and appreciation etc. Besides the story there are ten half page fun, educational word searches (aka wordfinds) and ten full page ones—short ones for younger students in particular, long ones for older students or higher level readers. HOW TO GET $ALE$ $AVING$: If you have time to wait, simply click the tiny green star or Follow Me to get a newsletter sent only once a month by me telling of new products, sales (usually on some weekends), etc. Thanks for considering a purchase; please come again.